After 14 weeks our general purpose initial police dog teams graduate and enjoy their passing out parade with their puppy walkers, family and friends. Pictured above at today’s passing out parade are Mark Stephens with Brock, Chris Carter with Nessa, Course Instructor Graham Attwood and Martin Prince with Merlin along with all of their puppy walkers, family and friends. The teams completed 13 hard but enjoyable weeks before finally being assessed by Home office Police dog Instructor Ian from Derbyshire Police on Monday and Tuesday this week. Ian was very impressed with their overall standard and granted the teams their license to be Operational general purpose Police dog teams. At the conclusion of the General purpose Police dog course we always have a passing out parade where the handlers enjoy the final day with their family and friends. We also invite the puppy walkers to thank them for all of their dedication and hard work in raising our pups. Mark and Brock will be stationed at Ashburton. Brock has big shoes to fill following in the footsteps of retired Police dog Axel but with Mark’s enthusiastic and energetic work ethic Brock will soon get the hang of what is required. Brock was imported from Belgium at 15 weeks and was bred by Walther Verbruggen. He was puppy walked by Colin, Mitzi and Luke Belsher. Brock is pictured here with his family. Chris and Nessa ( Previously Elsa) will be stationed in North Devon and just like Brock she also has big shoes to fill following in the footsteps of Chris’s retired Police dog Maverick. Nessa was bred by Bernard Horton of Kazzardsway German shepherds in Manchester. Nessa was initially puppy walked by Steve Pearce and his family from May 2017 to February this year. She was then walked by Chris Walther and his family. Our intention was for Chris and his family to keep Nessa for the rest of her life and hopefully for her to have puppies for our puppy program. Unfortunately her hips were just slightly below the level required for a breeding female but well above average as a working dog. Nessa was then allocated to Police dog handler Chris Carter to replace his retiring Police dog Maverick. Chris particularly wanted a female because Maverick is a very masculine male and probably wouldn’t have been particularly welcoming to another male dog. Nessa lives with Chris’s family and gets on really well with Maverick and his drugs dog Rosie. Martin and Merlin will be stationed in Ferndown in Dorset. Martin is a first time dog handler with 10 years Police experience and in Merlin has a dog with exceptional potential. For a first time handler Martin has impressed me both in terms of his natural handling skills, his empathy and the bond they have together. Merlin was bred by Ian Morgan of Lorockmor working dogs in Shropshire. He was puppy walked by Lyn, John and Ian Parlour. Today Merlin certainly remembered his puppy walkers just as all the dogs do. Martin and his family are pictured here enjoying the day. After the photos of family and puppy walkers there was time for a course photo before a short display. The handlers gave a short demonstration of their heelwork. Martin and Merlin then gave a demonstration of tracking down an offender who had run off down a track and was hiding in woodland. They tracked and located him but he then ran off and was then detained by Merlin. Chris and Nessa then demonstrated a search and locate of an armed criminal. Mark and Brock then completed the display by dealing with a criminal firing a gun. We all then made our way indoors for refreshments and presentations. Mark’s wife Bex made an incredible cake to celebrate the end of a very successful and enjoyable course. ACC Davies then presented the puppy walkers with a framed picture of their puppy as a thank you for their hard work and commitment. The handlers also received their certificates for successfully completing their General purpose Initial Police dog course. Then it was time to disperse and a sense of pride of a job well done by our puppy walkers and handlers. We have been running our puppy program now for over 25 years and all of our dogs now come through the program. It couldn’t function without our dedicated puppy walkers and although it is a really enjoyable day to see the dogs graduate I always have a sense of sadness for the pups that didn’t make it and the disappointment of those puppy walkers. I apologise that this blog isn’t up to my usual standard in terms of information and presentation but my wife and I are off to London for a short break in the morning and I had to rush to get it ready before we left. We will be having a Xmas get together for all of our pups and puppy walkers on Sunday 23rd December as we do every year. The current general purpose initial police dog course teams prepare for their assessments and passing out parade. As I write this blog the teams have completed 13 weeks of the Initial Police dog course and will be assessed on Monday 10th December as to their suitability to become operational Police dog teams. They will be assessed by a Police dog assessor from an outside Police dog section. From Left to right are Chris with Nessa, Martin with Merlin and Mark and Brock. Sadly we have had to release Peppe from the course on week 10 due to him developing an uncertainty towards people approaching him under certain circumstances. There were signs of this in the early part of the course but this became more prevalent as the course went on. Here is Peppe with his handler Kevin during the course. He was doing really well on all of his core exercises but every now and then he would issue a warning to the odd individual who came to close to him. This is nearly always a nerve issue and closer evaluation confirmed this. With time, confidence building exercises can eradicate this but to continue training as a Police dog would entail encouraging him to be aggressive in certain circumstances and we think this would be counter productive to his future development. If a dog doesn’t have solid nerves there is always a risk that the dog may well bite in circumstances that he/she shouldn’t do because of insecurity. Our dogs have to search for vulnerable elderly missing people on a regular basis and we can’t run the risk of a dog misinterpreting the situation and biting someone he/she shouldn’t. Chris and Lyndsay collecting Peppe from our house after I brought him from Holland aged 15 weeks. 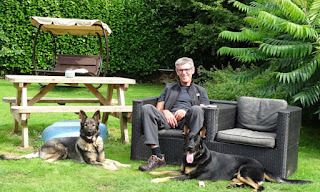 Peppe has been re-homed with Walter Harrison a Gamekeeper for 28 years who has had many ex Police dogs. Walther’s son is a current serving Police dog handler in Dorset and so Peppe is in good hands and will be kept busy assisting Walther in his game keeping role. Graham the course Instructor has been running 12 month old Ben alongside the course as the spare dog just in case one of the dogs on the course had to be released. With Peppe being released normally the spare dog would then be allocated to the handler who has lost his/her dog. However Ben only came onto the course at week 5 and as Kevin is an inexperienced handler we thought it better if Kevin takes Bill home for 6 weeks and gets to know him and bond with him before returning and starting a new course in January 2019. I will be reporting in my next blog how the remaining teams get on with their assessments and their passing out parade. Mixed emotions for our puppy walkers as their pups prepare to be transferred to their new handlers for the 2019 January general purpose initial police dog course. 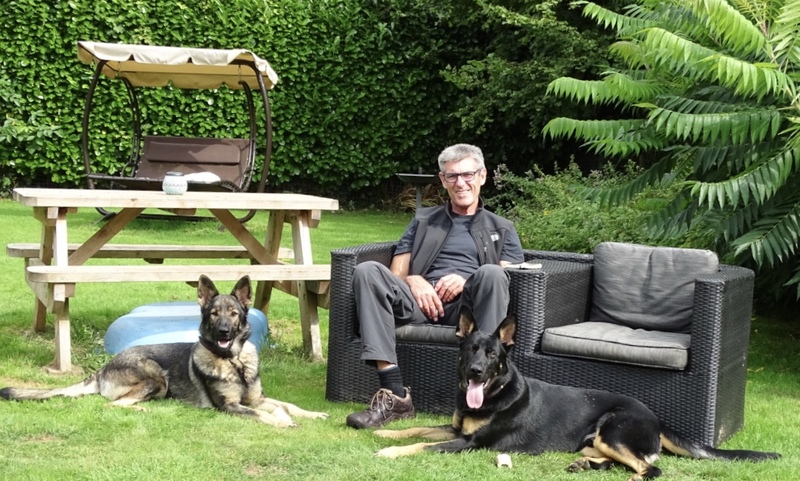 From left to right are Puppy walker Karol with Lola, Phil with Sydney and Stuart with Ben. As we approach their Police dog course which starts on January 7th 2019 we have been busy preparing them with training exercises, environmental assessments, boldness tests and they have had their hips X Rayed to make sure that they are fit to withstand the rigors of operational work. Unfortunately Lola who has been doing really well on her work and environmental development has failed her hip x rays which means that she cannot go forward as an operational general purpose Police dog. All is not lost because she may still be able to work as a specialist search dog for drugs, explosives or electronic devices. This work is not so intensive on her joints and so she will be assessed by Graham when he has finished instructing the current Initial Police dog course. Here is Lola on one of her training days showing good search drive for a toy. She certainly has a lot of natural working aptitude and Graham is very much a fan of the Malinois and Dutch herder breeds. One of the things she didn’t like was being lifted up in the air and so Karol and his family have worked on this. This could be very useful if she is to become a search dog. All 3 dogs have performed well on their working and environmental assessments. Here is Sydney with puppy walker Phil in Exeter city centre meeting the staff of Debenhams before going inside to see how he coped with their shiny floors and going up and down their escalators. On our training days Sydney is enthusiastic, determined, confident and extremely willing and biddable. He certainly loves his criminal work although sometimes I think Phil seems to enjoy it more than Sydney does. Sydney has the most incredible temperament he loves meeting people and shows the same happy go lucky friendly attitude meeting other dogs and livestock. Here is Ben on one of his boldness tests coming across a very dubious character at the top of a field and showing what a bold dog he is calmly investigating without a hint of fear. Ben is a very driven energetic dog who would quite happily work all day but can also relax and chill out when the mood takes him. Ben looks to be a natural tracking dog. Here he is tracking with Stuart showing a real low nose with excellent concentration. Recently Stuart has had problems with the fit on his prosthetic leg which has prevented him exercising Ben. Fortunately his wife Wendy is a very resilient lady and has been holding the fort while Stuart gets used to his replacement leg. It has been a pleasure watching our dedicated puppy walkers developing these 3 impressive dogs. I will be doing a blog in the New Year introducing you to their new handlers and giving an outline of their journey from young 8 week old pups to being allocated to their handlers. Ben and Sydney will be allocated to their new General purpose Police dog handlers towards the end of December. Hopefully Lola will be successful on her assessment to be a search dog in the New Year. Left to right are Eddie, Errol, Eyke, Echo and Ernie on a recent training day with their puppy walkers. It has certainly been a busy few months since the E litter last featured in the blog. During the summer all of the litter underwent environmental development training in Exeter city centre to see how they coped with shiny floors, stairways, lifts, escalators, traffic, crowds, other dogs, open metal stairs, and all the other busy city centre sights. Here is Ernie on the shiny floors in Debenhams. All the puppy walkers had previously received instruction on how to stop their dogs from pulling on lead and how to prevent them reacting towards other dogs. Here is Ernie calm and relaxed alongside a busy main road. The dogs all coped extremely well with everything they encountered and I was particularly impressed with the way they all dealt with a vibrating bridge high over a busy main road. Here is Echo taking it all in her stride. Here is Echo with puppy walker Michelle enjoying the music before continuing on her explorations. Here is Sue with Errol confidently making his was up and down the marble stairs in the shopping precinct. At first Errol didn’t know what to make of Truffle the dummy guide dog but soon became good friends. Like most of the dogs Eddie was a bit unsure about negotiating open metal stairs under the Princesshay shopping centre but with patience and time he overcame his caution and became very confident. The whole purpose of the city centre day was about development and not testing the pups. Of course we had to have a coffee while we trained the dogs not to react to people and other dogs passing by. Then it was back to work for Alaina to demonstrate how to walk her dog Eddie in a relaxed manner. It wasn’t all plain sailing because Eddie and Echo are particularly reactive towards meeting other dogs on lead. It is a common problem and is nearly always to do with a dog feeling insecure seeing and meeting other dogs whilst restrained on lead. Eddie was recently attacked by 2 German shepherds who ran from a house into the lane Eddie was being walked along on lead and he required a vet visit as a result. He wasn’t seriously hurt but this incident isn’t going to help his mistrust of other approaching dogs. Whether you employ a correction or reward to prevent reactive behaviour it must be employed the second your pup sees the other dog and before they react. With a correction I will use a distraction spray which is delivered calmly and quietly whilst moving on in a business-like manner. Paul and Michelle have been working hard on playing tug with Echo the second she sees another dog. This is paying dividends as can be seen on the attached video where Echo is on lead in a park when an inconsiderate owner allows his dogs to charge over to Echo off lead. Eyke is a very strong willed pup with a very intense chase instinct which has required a lot of work by his puppy walker Rob to maintain control over him. Because of this I took the reins to give Rob some pointers and guidance on how to walk him on a loose lead and ignoring distractions. Rob then took over and handled him extremely well. Because of the hot summer with little or no rain for 3 months I decided to postpone starting their tracking training until the ground had some moisture in it. This meant we didn’t start our tracking until they were nearly 8 months old. It didn’t matter because all 5 pups showed a natural tracking ability and are already showing they are going to be excellent tracking dogs. Here is Echo making it look very easy and she certainly has enthusiasm. Here are the teams practising their track laying skills before running the tracks with their pups. They all love their protection work as demonstrated here by Eyke and Eddie. They are all happily doing search, locate and bark in a building as demonstrated here by Eyke. Here is Errol practising his control work with a nice solid down stay. All 5 dogs have done extremely well on their environmental and work assessments but I have identified some sound sensitivities with Eddie which sadly means he has had to retire from the program. Eddie has been puppy walked by Alaina and her partner Ryan since he was 8 weeks. Here he is being collected by Alaina from our house in April this year. In recent months we assessed the pups to see if any of them were affected by sound. This involves their reaction to gunfire and loud and unusual noises. We found that Eddie was affected by certain noises and sounds which precludes him from being a Police dog. Alaina on his farm visit. His general confidence, temperament, and working ability are excellent but he does have sensitivities to certain sounds and it would be unfair to put him in the type of stressful situations that a Police dog has to deal with. Here he is at the Devon county show aged 12 weeks with his littermates Ernie and Echo aged 12 weeks. Here he is at the show being taken over the ramps with Alaina. When I do these blogs I always find it emotional looking back at the photos of the times we have had together when a puppy has to leave us. His puppy walkers Alaina and Ryan have decided they wish to keep him which I am really pleased about. Alaina has worked extremely hard with Eddie and has impressed me with her commitment and skills. I would like to thanks Alaina, Ryan and Alaina’s mum Hilette for all of their hard work. He stayed with me for 3 days this week while I worked on his reactivity to other dogs. This went well and I have now signed him over to his permanent family. I am sure Eddie will be very happy. Eyke from our E litter has been with Rob, Lisa and the girls since he was 8 weeks old. From day 1 Eyke has been a real handful and has a tendency to want to chase everything that moves. Rob and the family have been to all of our training sessions and have worked hard on his chase issues with great success. Here is Lisa working on Eyke’s control on the down stay. Unfortunately Lisa suffers from Chronic fatigue syndrome and this has progressed in recent months and she has found it increasingly difficult looking after Eyke Monday to Friday during the daytime when Rob is at work. In recent months I have been taking Eyke with me on a regular basis to ease the pressure on Lisa while we looked to find a suitable alternative puppy walker for Eyke. This has taken several months and I was becoming concerned for Lisa and also Eyke because he was becoming too attached to me and my dog Ella. Step forward Eamon and Karen Rogers who have puppy walked many dogs previously for us in North Devon. I am extremely grateful to Rob, Lisa and the girls for the job they have done with Eyke which has given him a solid foundation for the next stage in his journey to be a Police dog. My next blog will update you on how the current Initial Police dog course do on their assessments and their passing out parade. From Ella, Larry and me bye for now.